New Delhi, Oct 2 (IANS) President Ram Nath Kovind and Prime Minister Narendra Modi on Monday remembered the Father of the Nation Mahatma Gandhi on his 148th birth anniversary. “Bow to beloved ‘Bapu’ on Gandhi Jayanti. 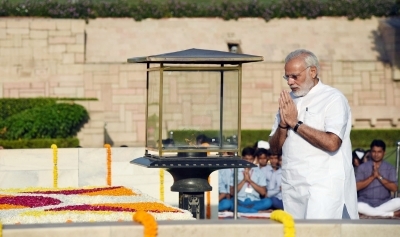 His noble ideals motivate millions across the world,” Modi tweeted sharing a video of Mahatma Gandhi. 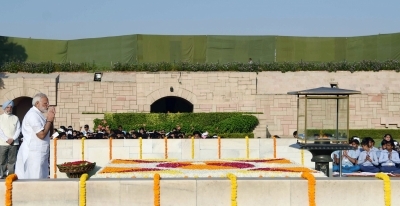 The Prime Minister also visited Rajghat and laid a wreath. 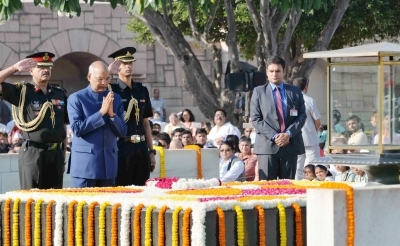 Kovind, Vice President M. Venkaiah Naidu, former Prime Minister Manmohan Singh also paid floral tributes to ‘Bapu’ at Rajghat. Mohandas Karamchand Gandhi was born on October 2, 1869, in Porbandar in Gujarat to Putlibai and Karamchand Gandhi. His birthday is also observed as the International Day of Non-Violence. Gandhi was assassinated on January 30, 1948, by Nathuram Godse, a Hindu nationalist during a prayer meeting at the Birla House here. Gandhi is admired across the world for his non-violent philosophy of passive resistance. He was known to his many followers as Mahatma.